classic leopard print with a long hooked tail – has fierce looking eyes, a chunky nose and a red lined hood. The polyester fleece fabric is lightweight, soft, warm and machine washable. Like all our funzee products, these funzoo onesies are warm and comfy and can be used as sleepwear, loungewear, or fancy dress. But of course they are great for parties, festivals and carnival. How about a stag night, or charity fundraiser, or a corporate team building event? 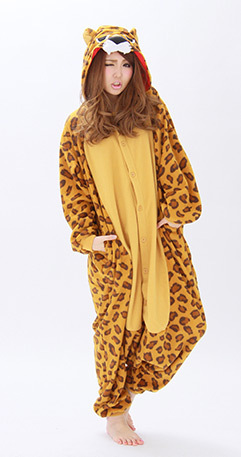 You are certain to get attention in these animal suits and have a wild time – Leopard for love cats everywhere. Sizing is easy – this is a one-size suit! How is that possible? Each design is generally loose with a long, baggy body but with elasticated wrists and ankles. This means that one size will suit just about any body shape from height 160 – 186 cms. So for ladies or men, granddad or younger sister, give someone the gift of laughter.